As referred to by his Tae Kwon-Do students, Master Souza holds the rank of Fourth Degree Black Belt, Master Instructor, and also the rank of Black Belt in Brazilian Jiu-Jitsu, or "Prefessor." Master Souza began training Tae Kwon-Do in 1991 receiving his first black belt in 1998. Souza started training Brazilian Jiu-Jitsu in the year 2000 and received his Jiu-Jitsu black belt in 2013. Bruno is an experienced local competitor in Jiu-Jitsu, kickboxing, also having competed at numerous nationals and international Tae Kwon-Do competitions. 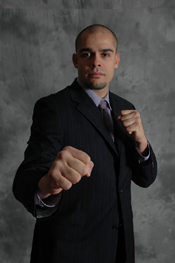 Master Instructor Bruno Souza is the president of Franklin Martial Arts in Bellingham, MA (formerly in Franklin, MA). His reputation and credentials span over two decades as a competitor, instructor, coach, motivator and innovator of martial arts, life-skills education and self-defense. Bruno has won over 100 medals and trophies in major tournaments such as the U.S. TKD Nationals, TKD Collegiate Nationals, TKD U.S. Junior Olympics, TKD Brazil Open, Pan American TKD, NAGA (North American Grappling Association) and more. He has studied Tang Soo Do, Bukedo Ju-Jutsu, Taekwondo, Brazilian Jiu-Jitsu, Boxing, Muay Thai & Krav Maga. Souza is a Taekwondo fourth “dan” (fourth degree black belt), or Master Instructor. He is also a Brazilian Jiu-Jitsu black belt, a certified Krav Maga instructor and nationally certified Taekwondo competition coach. As an instructor, Master Souza has graduated over twenty black belts. As an instructor trainer, he has certified several instructors, and as a coach has repeatedly led students from beginners to national champions. Bruno Souza has trained a professional and passionate staff of instructors who combine proven martial arts with superior teaching techniques. Our instructors demonstrate patience, a sense of humor and a true love of their sport that is passed on to all our students. We understand many join the martial arts for different reasons, and we are committed to helping each student achieve their unique personal goals. Our coaches are friendly, and are experienced teachers. We take pride in making our students learn, sweat and smile at the same time.